Four people, including two firefighters died and nearly people 50 were injured in a massive gas explosion that gutted the ground floor of a building in a central Paris shopping district on Saturday, authorities said. A partial shutdown of the U.S. government could slash job growth by as much as 500,000 in January and lift the unemployment rate above 4.0 percent unless the impasse in Washington is resolved before next Friday, economists warned. South Korean president Moon Jae-in announced on Thursday that he second US-North Korea summit as well as DPRK leader Kim Jong-un's visit to Seoul would take place "soon". Donald Trump has used the first Oval Office address of his presidency to stoke fears of illegal immigration, repeat dubious claims about his border wall and offer no new solutions to the partial government shutdown. Three Vietnamese tourists, who were seriously injured in a roadside bomb attack in Egypt in December 2018, are to leave hospital to travel home on January 9. 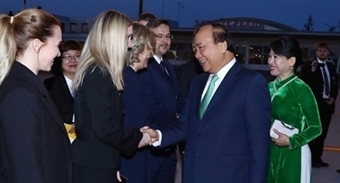 Thousands of Cambodian people, along with officials of ministries and sectors of the Royal Government of Cambodia, gathered at a ceremony in Phnom Penh on January 7 to mark the 40th anniversary of the victory over the genocidal regime. North Korean leader Kim Jong Un is visiting China at the invitation of Chinese President Xi Jinping since Jan.7 to 10. Six people were killed in a rail accident on a bridge linking Denmark’s two main islands on Wednesday when a train hit debris from an oncoming freight train, officials said. U.S. Congress was set to reconvene on Wednesday with no sign of a workable plan to end a 12-day-old partial federal government shutdown and President Donald Trump not budging on his demand for $5 billion in border wall funding. The wrong year, mistakenly projected in big, bold letters onto the Sydney Harbour Bridge during the city’s world-renowned New Year’s fireworks display, prompted social media users come up with a variety of witty remarks. 2019 might be a few days away but celebrations have already begun. Let's look at how people are welcoming the New Year all across the world.